Hello, friend! It’s been a week. Where have I been? Did I run away from this little thing called spilling the beans about my life on the internet “blogging”? I’ve truly missed you during my one-week hiatus. Last week, Mr. Unexpected came knocking on my door with a visitor called, “the flu”. Despite my best attempts to show my new guest the front door, he decided to stay and get comfy. I decided to take a few days to rest and work on an upcoming, super-exciting project launching in the fall. I missed our days sipping lemonade kombucha and talking about the crazy hen that escaped for the fourth time in two days, smothered in our crunchy lotion. But, I knew you’d understand the sudden hiatus. The good news? I’m back! You thought you could keep me away? Of course not, chicken noodle soup works wonders. 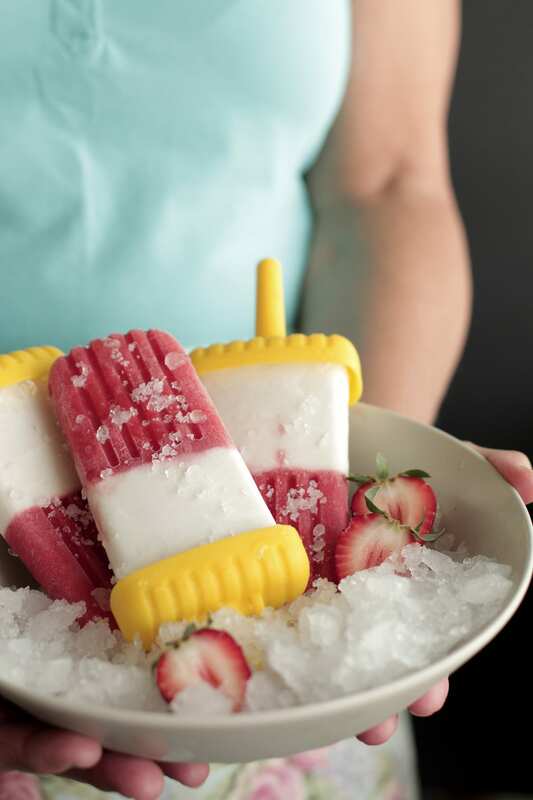 Now, let’s move on to the important things in life…butter, summer fruit, and ice cream. 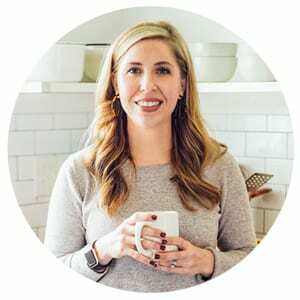 A few weeks ago, my secret blogger crush, Gina from So, Let’s Hang Out, sent me an invitation to a real foodie’s virtual potluck. Hello, sweet little invitation of my lifetime, of course, I’m coming! 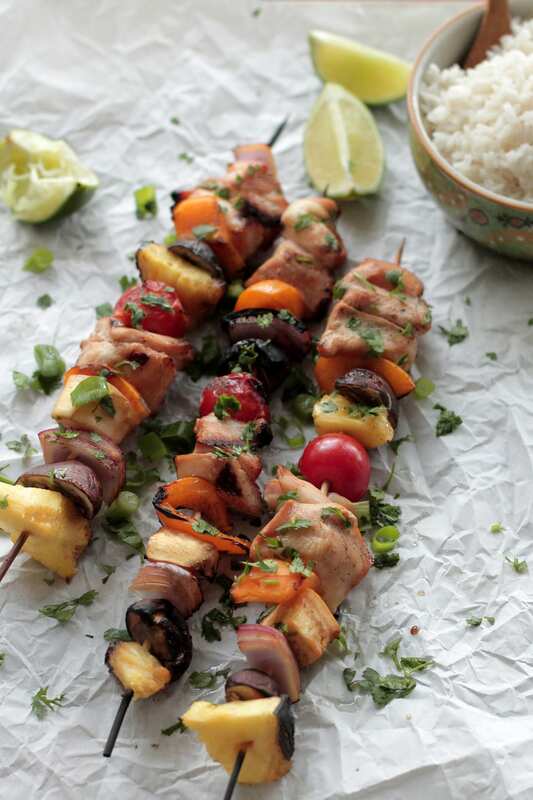 Can you imagine a potluck attended by over twenty foodies, all in one little place? Gorgeous dishes (we bloggers are notorious for our dish and prop obsession) and delectable food, with the amazing folks that make this land of the internet a beautiful and tasty place. Talk about pressure and excitement. Since that invitation arrived in my inbox, I’ve been agonizing over the perfect meal to bring. You’d think as a blogger who spends half her time playing with butter and creating recipes, coming up with a meal would be as easy as pie (which was a leading option). Clearly, this introvert needs to get out to more potlucks. The final decision? 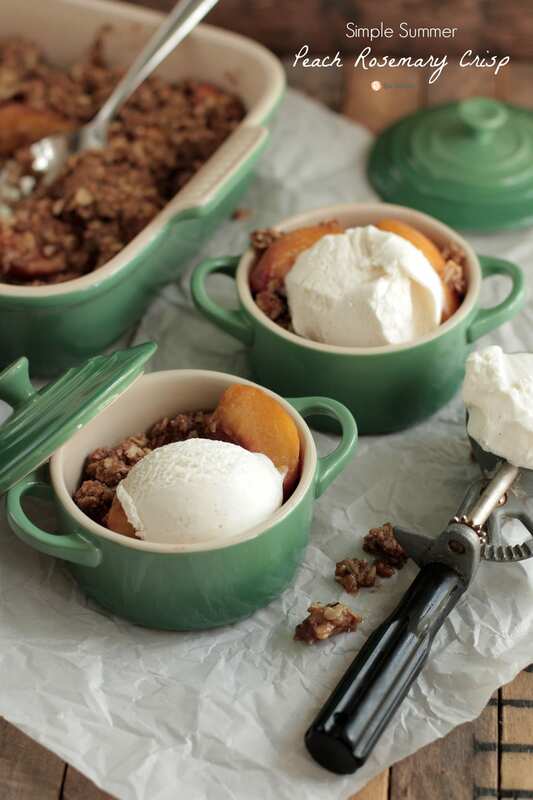 A quintessential summer dessert, Peach Rosemary Crisp. Simple, yet refined. Sweet and savory. Who doesn’t love a good helping of fruit, butter, a touch of savory herb, and churned cream? This dish is the ultimate summer dessert and takes less than ten minutes to prepare, which means plenty of time to get ready for a big blogger shin-dig like a potluck. If possible, I highly recommend serving this pan of guiltless pleasure straight from the oven and topped with homemade vanilla bean ice cream (also guiltless). You won’t regret it. In fact, you’ll probably need more than just one bowl. Sneaking over to the loaded dessert table for a second and third helping is A-okay at this foodie potluck. In fact, I’ll race you. I hope you brought your yoga pants, if not, I’ll loan ya’ a pair. 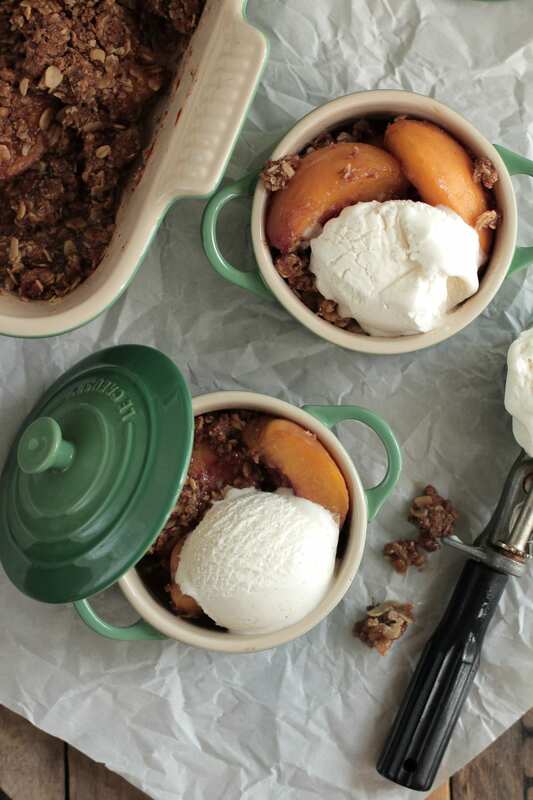 A quintessential summer dessert, Peach Rosemary Crisp. Simple, yet refined. Sweet and savory. 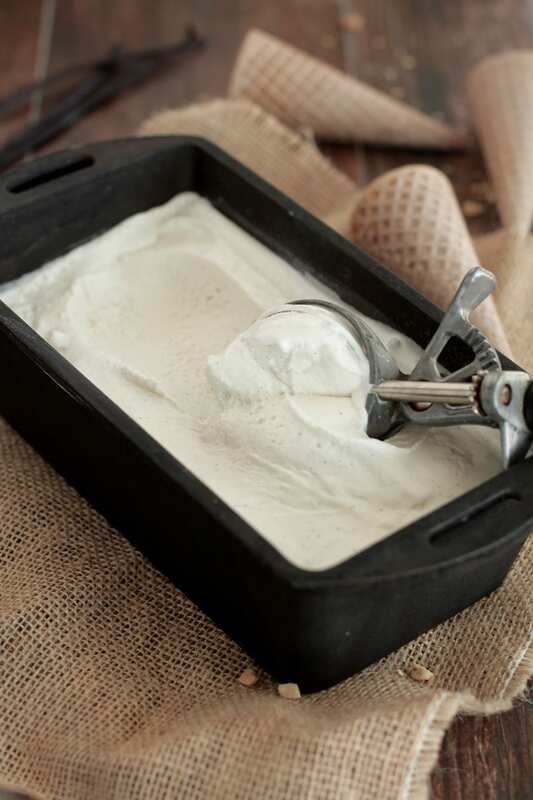 Who doesn’t love a good helping of fruit, butter, a touch of savory herb, and churned cream? Cut the peaches into quarters. Place in a 9x9 baking dish (I use this one). Pour the honey over the peaches. Toss the peaches in the honey. In a large bowl, whisk together: oats, flour of choice, sucanat, cinnamon, nutmeg, and rosemary. Add the cold butter cubes to the oat mixture. 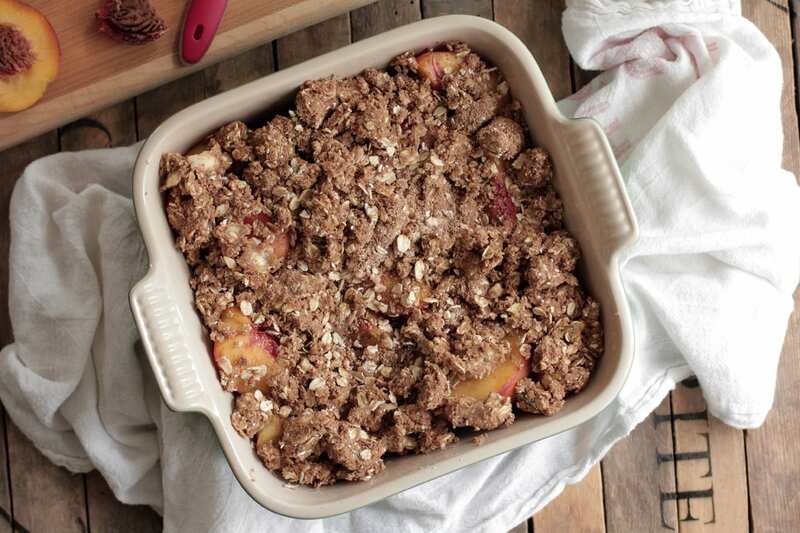 Using your hands or a pasty cutter crumble the butter into the oat mixture until the mixture is dough-like. 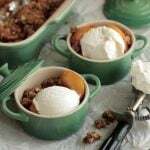 Evenly pour the oat "dough" over the peaches. 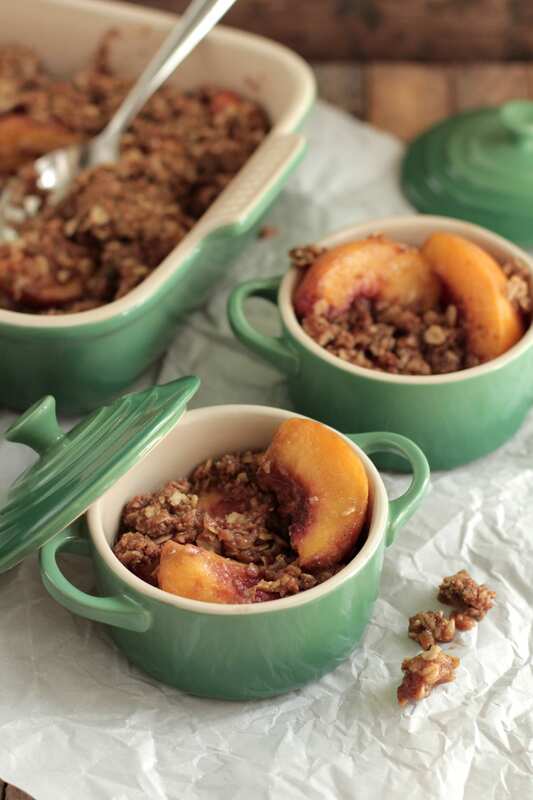 Bake for 30 minutes, until the peaches are soft and juicy and the "dough" is brown and crispy. Serve alone or (highly recommended) with homemade vanilla bean ice cream. You can find my little stoneware “bowls” here. I love peaches and rosemary on crostini with burrata so I’m sure this is fabulous! This sounds like dessert perfection!!! The thought of peach and rosemary together makes me swoon a little. Thanks, Meg! I agree, peaches and rosemary were made for each other. This is just sooo beautiful and I am sure tasty! YUM!! Thank you, Beth. I’m in love with your gorgeous tarts!! I love fruit with herbs, so I can’t wait to try this combination. Well done, lady!! Me too! Thank you, Kris. Yoga pants on. Ready to put this crisp in my face. Please pass a fork. We can go halfsies on this thing. I’m SO glad you joined us, Kristen! I love your blog. Let’s make this secret romance real. I’m in. Too much too soon? Ok, let’s just start with some crisp. Hey Gina, Totally blushing over here while stuffing my face with the last of the crisp! Thanks for inviting me. sometimes simple is the best. 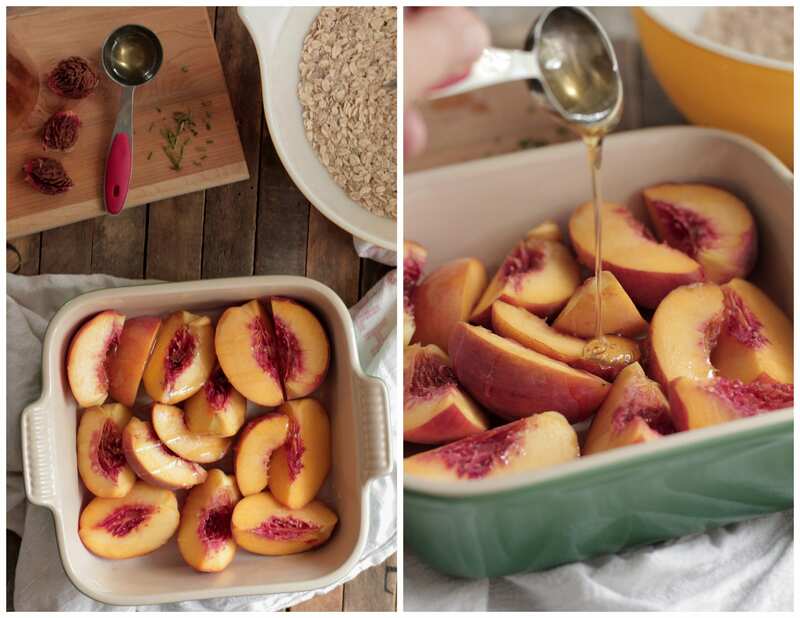 when it comes to stone fruit and summer baking it really doesn’t have to be complicated. this sounds delicious! 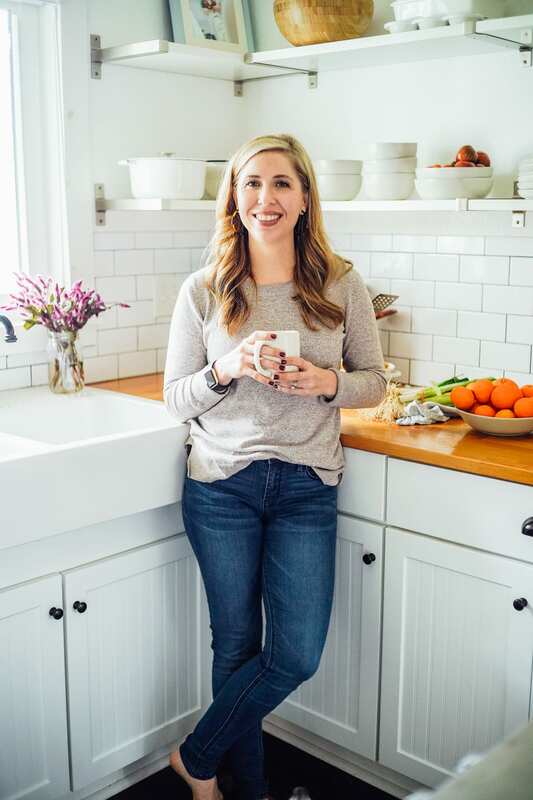 Yummers in my tummers, this sounds amazing – and I love those little green ramekins, Kristin! Super pretty to look at — and, of course, it sounds pretty tasty, too. (Rosemary + stone fruit? Yess!!) Thanks for potlucking with us. 🙂 xo! Thanks, Em! I loved joining in the potluck fun. Thank you for having me! Hi, I love this green Le Creuset. Can you please tell me what color it is? thanks!! Thank you, Desiree. It’s called Fennel.